When Dawn of the Planet of the Apes ended, war between the apes and the humans was imminent. When War for the Planet of the Apes starts, the war is two years old and things are getting dire. At a press event, director Matt Reeves introduced three scenes from the movie, in various states of completeness. In some shots, the visual effects were almost finished; in others, they were clearly only in their early stages. And there were some without any vfx ar all, where the human actors in their motion-capture suits were still there, in all their glory. The movie starts and it’s a straight-ahead battle/war movie and when Caesar decides he’s going to go on a vendetta against the Colonel, it becomes almost for a period like a western. Because he’s going to go on his own, he feels it’s too dangerous for the apes, he’s going to go and get Woody and his closest compadres, Maurice the Orangutan, Rocket, and Luca. They basically see that as a suicide mission, they don’t want him to go alone, they want their leader to return. So a “very unlikely posse” starts looking for where the humans are . As the film begins, we are two years into the fight. The [battles] which began in the city have moved into the woods, because the apes have the advantage of being able to know the area like the back of their hands. They don’t have tanks, they’re not armed the way the humans are, they have to scavenge weapons, and make their own weapons, and use their intelligence and find a way to survive. 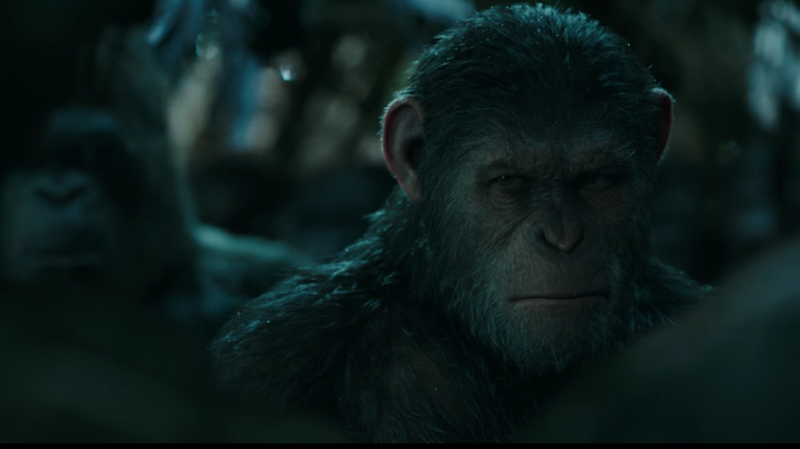 Right at the start of the film, the humans are looking for Caesar because he’s managed to keep the apes alive for two years and has become a legend in his own time. They’re in the forest because they’ve heard a rumor that Caesar is running the war from a secret base there. So the clip starts with the humans searching the woods. The opening scene we saw, which you can see parts of in the trailer, becomes a big battle scene, starting with a group of human soldiers moving through a forest, with things like “Monkey Killer” and “Bedtime for Bonzo” written on their helmets. The humans also have apes working with them: a big gorilla and a smaller monkey that acts as a lookout in the trees. The lookout monkey spots what everyone calls a “trench,” even though it’s more like a giant structure that looms over the forest ground. With a shot to one of Caesar’s apes, the fight begins. It’s guns versus arrows, and it seems like the technologically superior humans should be winning, but eventually Caesar shows up with reinforcements, who lob smoke bombs at the humans. A hail of arrows later, and almost none of the men are left. The fight is brutal to watch, even with some of the effects unfinished. Bodies literally pile up under the trench’s barricades. This scene is from the human perspective, and they seem as shocked as anyone that the tide turns so fast. Humans are shot full of arrows and the gorilla working with the humans takes one to the chest—we didn’t see him die, but it leaves open how much “Ape shall not kill ape” has fallen by the wayside since the last movie. The focus is on a relatively junior soldier named Preacher (Gabriel Chavarria), who uses the radio to call in to what I assume is the Colonel (Woody Harrelson). It’s telling that the Colonel merely orders him to take as many apes down as he can once he’s told that the humans have lost—instead of ordering a retreat. Preacher is grabbed by an ape and he yells, “No.” We next see Preacher with about four or five other captured humans. Ceasar marches through the compound, flanked by two other apes. All the apes part for Ceasar, who is grim and hard now. He walks up to the prisoners and, before we see what he does with them, the scene ends. The battle was epic, but the bit that stood out the most was the gorilla working for the humans pausing in the middle of the battle to look at all of his kind. The effects are so good that I could see the complicated thoughts about loyalty and what group he “belongs” to on his face. And then the rage when he takes an ape arrow to the chest. “The story starts to be about finding Woody at a certain [point], and then of course when they find each other it turns out that the story and the world of the film is much bigger,” said Reeves. They’ve just lost the humans and they’ve been picking up all these clues on the way, they’re finding some soldiers that have been left dead by the side of the road in the snow. There’s this grand growing sort of snowball of a mystery. They’re trying to orient themselves. The apes have climbed up a radio tower to try and see where the army might be. And as that happens, someone who looks like it might be a human deserter or something starts rummaging through their packs. The thief is only shown from the back, wearing a jacket and gloves. While the chase scene in the snow was impressive, it was the reveal that occurred once Caesar and company caught up to the thief that deserves the most attention. When Caesar finds the thief, he’s inside what was clearly an impressive house once. It’s all broken down, but you can see that it used be a rich family’s mountain escape. Even more interesting is the identity of the thief: it’s an ape, played by Steve Zahn. His name is Bad Ape—he uses that to describe himself because that’s how the humans used to refer to him. He can’t speak sign language, but his English is very good. Bad Ape is really excited to have friends since he’s been living alone in the Sierra Nevada mountains on his own for a long time. He’s a former zoo ape who escaped once the humans got sick and started killing the animals. And he explains that as the humans got sick, he got smarter. More importantly, Bad Ape shares with the group some packaged food labeled “quarantine center.” Bad Ape explains that once he escaped the zoo he went looking for food and found a “human zoo,” he killed a “bad human” (a guard, presumably), and then raided the place for supplies. He says it’s empty now, every human died. Ceasar and the others determine that the Colonel and his troops are headed for the abandoned center, which should have food and weapons. Ceasar demands Bad Ape take them there, but Bad Ape, skittish and clearly a little off, says it’s too dangerous and refuses. Plus, he points out, it’s snowing really hard. Zahn’s Bad Ape combines comic relief and exposition in a neat way, and he’s got a lot of things, some of them major, to impart. Zahn’s whole speech is interspersed with him taking a shiny object out of the hands of the human girl (yes, she comes with them, under the care of Maurice the orangutan) every time she picks it up. It’s his, he says. But he’s also capable of great compassion, giving his coat to the shivering human girl. And then, after insisting he can’t help them, he hands the shiny object to the girl as a gift. The mute child clutches the decal of a Chevy Nova—a nice shout-out to the original Planet of the Apes. 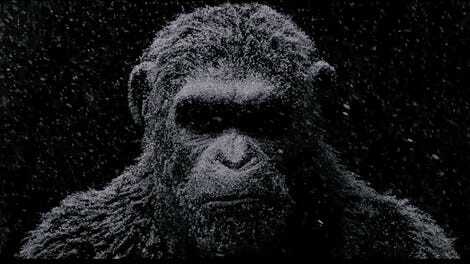 Both new scenes really had me feeling for the apes that aren’t Caesar. In what we’ve seen, Ceasar’s hardline approaches don’t make him sympathetic. But the gorilla working for the humans really touched me. As did Bad Ape’s joy at no longer being alone. His talk of “new friends” and his tenderness, peppered with a lot of eccentricity (he has a tendency to run off during conversations) gives him a ton of personality right off the bat. War for the Planet of the Apes comes to theaters July 14, 2017.